Take PECU with you! Our new secure Apple and Android mobile apps give you immediate access to PECU from your mobile device. Pay bills, send money, make deposits using your camera, transfer funds and much more! Do your business any time, any place and anywhere with our new apps. Our mobile app is designed with a tablet-first approach and unified look across all devices. Make sure you have registered and have access to online banking with your own Login ID and password. Search “PECU Mobile” in the Apple App Store or Google Play on your Apple or Android mobile device. Download the app to your mobile device. This may take a few minutes. Login using the same Login ID and password you use for PECU online banking. If you have not registered for e-Branch Click here. 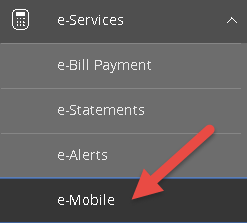 To Register for e-Deposit, login to online banking on your computer with your Login ID and click e-Services > e-Mobile. Follow the instructions listed here. For access to e-Mobile Deposit or if you have questions about our new apps, please contact PECU Financial Services at 512-474-1955, 800-772-1955 outside of Central Texas, or send us an e-Message!